This platform arcade game is the debut of Data East's mascot of the same name. 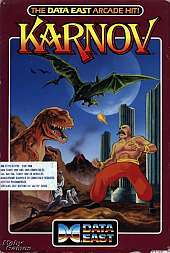 Karnov, the fire-breathing ex-circus strongman Russian, is seeking the Lost Treasure of Babylon. He runs, swims, jumps, climbs, and flies through nine levels of gameplay. However, between him and the treasures are several horrendous monsters, including sword wielding monks, djinn, foot hopping giant fish and ostrich-riding skeleton warriors. He can find special items that will help him on his way such as jump boots, bombs, ladders, boomerangs, and super fireballs. He also can collect red orbs with which he can upgrade up to three fireballs at a time. Each level contains a variety of strange enemies, such as gargoyles, rock creatures, and strong men, which Karnov must destroy or avoid. When he reaches the end of a level he usually has to face one or more powerful enemies which he must defeat to beat the level and receive a new piece of a treasure map. At the end of the game he must face a powerful boss often called "The Wizard" and collect the treasure.